Corrie Knudson (left) of the Sons of Norway Foundation congratulated Mae Hovland during a performance by the Peer Gynt Dancers at the Synnøve Nordkap Lodge meeting April 11 2017. Photo: Ron Stow. 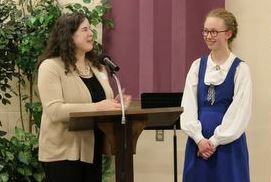 Mae Hovland, a graduating senior who has danced with our group for 11 years, will get an extra boost during her year in Japan next year thanks to a scholarship from the Sons of Norway Foundation. Mae received the Lund Fund Scholarship to support her year as a Rotary Youth Exchange Ambassador in Japan 2017-2018. She will live with several different host families in Shinmachi, in the Gunma Prefecture, about two hours northwest of Tokyo. Mae will spend her gap year at a Japanese high school before heading to The University of Virginia’s School of Engineering in Charlottesville, Virginia. Mae was the Class of 2017 Salutatorian at St. Croix Preparatory Academy in Stillwater. “All my life, my Norwegian heritage has been an essential part of me. Sometimes it’s subtle, such as wearing an itchy wool Norwegian sweater or saying “takk” to my mom after she passes me the salt at the dinner table. Sometimes it’s obvious, like when I perform with my Norwegian folk dance group, or when I try to force down a couple bites of Lutefisk at Christmas Dinner. Congratulations Mae and lykke til! Previous Previous post: Our Best Parade Ever! Next Next post: See Norway’s Tinndølan Youth Dancers!